Cassia Bark or Oil is used to address appetite loss, dyspepsia and spasms associated with bloating, flatulence, nausea and diarrhoea. It has also been used traditionally for the common cold and exhaustion. The flowers are a traditional "blood purifier". *Note: Bianca Rosa Cassia Pure Essential Oil is not to be taken internally. Cinnamomum aromaticum Nees (= C. Cassia Blume). Other Names: Canelle de Chine (French); Chin. Zimtbaum (German); cassia lignea (Italian). Description: C. aromaticum is a large evergreen tree of up to 10 m in height with simple, alternate leaves that are three-nerved from the base. The inconspicuous flowers are yellowish white and are followed by round drupes of about 8 mm in diameter. It may be distinguished from true cinnamon (C. verum) by the alternate leaves (opposite or subopposite in C. verum) and by the smaller, rounded fruit (larger - ca. 15 mm, and oblong in C. verum). Origin: Myanmar, formerly Burma. The tree has a long history of commercial cultivation in China, Indonesia and Vietnam. Therapeutic Category: Appetite stimulant, dyspeptic disorders. Active Ingredients: Bark contains volatile oil with cinnamaldehyde as the main constituent (about 90%) and other derivatives of cinnamate. It is easily distinguished from real cinnamon (C. verum) by the presence of 0.45% coumarin and the almost complete absence of eugenol (except for a provenance from Nigeria). Bark is rich in procyanidins, phenylpropanoids and mucilage. Pharmacological Effects: Anti-ulcer, antispasmodic, choleretic, hypotensive and antiseptic properties, amongst many others, have been documented for mostly the oil. Antispasmodic activity has been linked to cinnamaldehyde. Status: Pharm. ; Comm. E+; WHO 1. 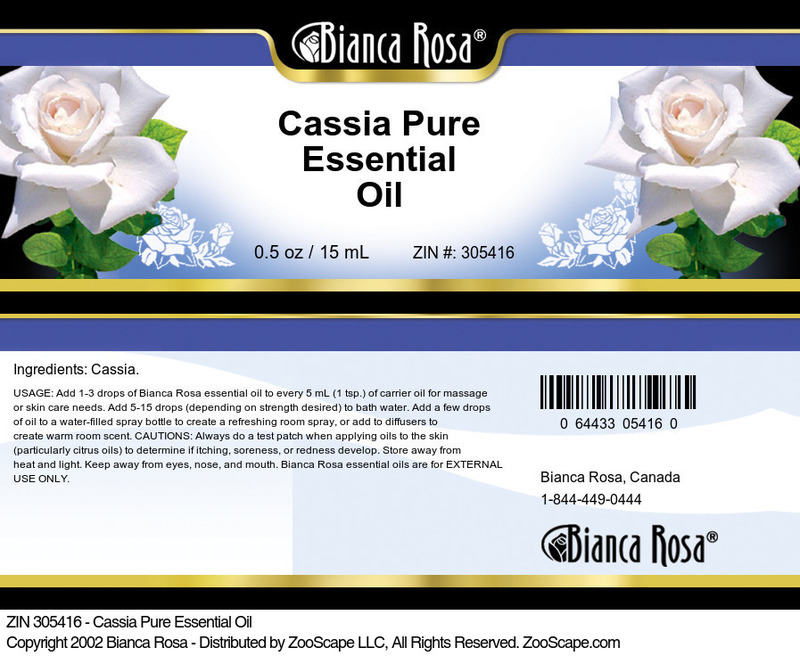 *Note: Bianca Rosa Cassia Pure Essential Oil is not intended for internal use. However, consumption of food-grade cassia bark is generally regarded as safe, even during pregnancy (GRAS status in the USA) provided that the daily intake of cinnamaldehyde, through spices or medicine, not exceed 0.7 mg per kg body weight. The oil (probably the cinnamaldehyde), whether it is food-grade or not, may cause allergic reactions in some people, so that topical use is typically not recommended.